In the summer season, some horses experience recurrent skin reactions at the base of the tail or around the mane, generally caused by bites from small flies known as midges. Its unique formula combines five concentrated essential oils, plus plantain and aloe vera extracts. Its balm format and precision nozzle enable clean and precise application. Raw materials: Water, benzyl benzoate, calendula (essential oil), chlorhexidine, lavandin (essential oil), allantoin, geranium (essential oil), eucalyptus (essential oil), dried plantain extract, Aloe vera. 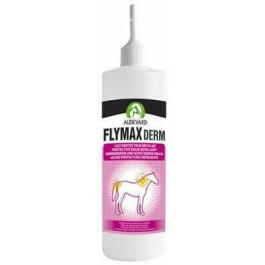 Flymax Derm is an essential oil product for horses with skin sensitivity caused by insect bites during the summer. Apply once or twice a day to affected areas. Midges are more active in the evening so the recommended time to apply Flymax Derm is late afternoon.